Note: For the Roman god Saturn please click here. 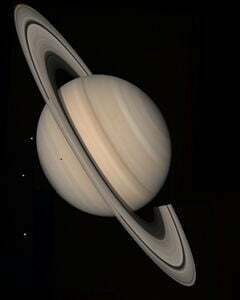 In the Solar System, Saturn is the sixth planet from the Sun. It is a gas giant (also known as a Jovian planet, after the planet Jupiter), the second-largest planet in the Solar System, after Jupiter. Saturn has a prominent system of rings, consisting mostly of ice particles with a smaller amount of rocky debris and dust. It was named after the Roman god Saturn (the Greek equivalent is Kronos, father of Zeus). 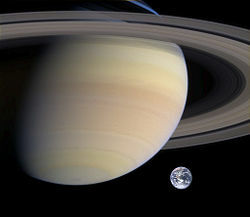 Given its unique appearance with rings, Saturn must have inspired astronomers and others to regard it as a miniature Solar System, with objects of various sizes orbiting it. Saturn has been known since prehistoric times. It is the most distant of the five planets visible to the naked eye, the other four being Mercury, Venus, Mars, and Jupiter. It was the last planet known to early astronomers until Uranus was discovered in 1781. To the unaided eye, Saturn appears in the night sky as a bright, yellowish star usually varying in magnitude between +1 and 0. It takes approximately 29.5 years to make a complete circuit of the ecliptic against the background constellations of the zodiac. An optical aid, such as large binoculars or a telescope, that magnifies at least 20X is required to clearly resolve Saturn's rings for most observers. Although it is a rewarding target for observation for most of the time it is visible in the sky, Saturn and its rings are best seen when the planet is at or near opposition—that is, when it is at an elongation of 180° and appears opposite the Sun in the sky. In the opposition on January 13, 2005, Saturn appeared at its brightest until 2031, mostly due to a favorable orientation of the rings relative to the Earth. Saturn is an oblate spheroid—that is, it is flattened at the poles and bulges at the equator; its equatorial and polar diameters vary by almost 10 percent (120,536 km vs. 108,728 km). This is the result of its rapid rotation and fluid state. The other gas planets are also oblate, but to a lesser degree. Saturn is the only planet of the Solar System that is less dense than water. Although Saturn's core is considerably more dense than water, the average specific density of the planet is 0.69 due to the gaseous atmosphere. Saturn's temperature emissions. The prominent hot spot at the bottom of the image is at Saturn's south pole. Saturn's interior is similar to Jupiter's, having a rocky core at the center, a liquid metallic hydrogen layer above that, and a molecular hydrogen layer above that. Traces of various ices are also present. Saturn has a very hot interior, reaching 12,000 Kelvin (11,700°C) at the core, and it radiates more energy into space than it receives from the Sun. Most of the extra energy is generated by the Kelvin-Helmholtz mechanism (slow gravitational compression), but this alone may not be sufficient to explain Saturn's heat production. An additional proposed mechanism by which Saturn may generate some of its heat is the "raining out" of droplets of helium deep in Saturn's interior, the droplets of helium releasing heat by friction as they fall down through the lighter hydrogen. Saturn's atmosphere exhibits a banded pattern similar to Jupiter's (in fact, the nomenclature is the same), but Saturn's bands are much fainter and are also much wider near the equator. Saturn's winds are among the Solar System's fastest; Voyager data indicates peak easterly winds of 500 m/s (1116 mph). Saturn's finer cloud patterns were not observed until the Voyager flybys. Since then, however, Earth-based telescopy has improved to the point where regular observations can be made. Saturn's usually bland atmosphere occasionally exhibits long-lived ovals and other features common on Jupiter. In 1990, the Hubble Space Telescope observed an enormous white cloud near Saturn's equator which was not present during the Voyager encounters and in 1994 another, smaller storm was observed. The 1990 storm was an example of a Great White Spot, a unique but short-lived Saturnian phenomenon with a roughly 30-year periodicity. Previous Great White Spots were observed in 1876, 1903, 1933, and 1960, with the 1933 storm being the most famous. The careful study of these episodes reveals interesting patterns; if it holds, another storm will occur in about 2020. Recent images from the Cassini spacecraft show that Saturn's northern hemisphere is changing colors. It now appears a bright blue, similar to Uranus, as can be seen in the image below. This blue color cannot currently be observed from earth, because Saturn's rings are currently blocking its northern hemisphere. One theory is that this shocking color change is a result of colder temperatures, as the shadows cast by Saturn's rings are blocking out sunlight. This would result in the yellow clouds sinking and Saturn's deeper blue atmosphere being revealed. Visual comparison of Saturn and Earth. Astronomers using infrared imaging have shown that Saturn has a warm polar vortex, and is the only planet in the solar system known to do so. An apparently permanent hexagonal wave pattern around the polar vortex in the atmosphere at about 78°N was first noted in the Voyager images. HST imaging of the south polar region indicates the presence of a jet stream, but no strong polar vortex nor any hexagonal standing wave. However, NASA reported in November of 2006 that the Cassini spacecraft observed a 'hurricane-like' storm locked to the south pole that had a clearly defined eyewall. This observation is particularly notable because eyewall clouds have not been seen on any planet other than Earth (including a failure to observe an eyewall in the Great Red Spot of Jupiter by the Galileo spacecraft). Given that Saturn does not rotate on its axis at a uniform rate, two rotation periods have been assigned to it (as in Jupiter's case): System I has a period of 10 h 14 min 00 s (844.3°/d) and encompasses the Equatorial Zone, which extends from the northern edge of the South Equatorial Belt to the southern edge of the North Equatorial Belt. All other Saturnian latitudes have been assigned a rotation period of 10 h 39 min 24 s (810.76°/d), which is System II. System III, based on radio emissions from the planet, has a period of 10 h 39 min 22.4 s (810.8°/d); because it is very close to System II, it has largely superseded it. While approaching Saturn in 2004, the Cassini spacecraft found that the radio rotation period of Saturn had increased slightly, to approximately 10 h 45 m 45 s (±36 s). The cause of the change is unknown—however, it is thought that this is due to a movement of the radio source to a different latitude inside Saturn, with a different rotational period, rather than an actual change in Saturn's rotation. Saturn is probably best known for its planetary rings, which make it visually one of the most remarkable objects in the Solar System. The rings were first observed by Galileo Galilei in 1610 with his telescope, but he was unable to identify them as such. He wrote to the Duke of Tuscany that "The planet Saturn is not alone but is composed of three, which almost touch one another and never move nor change with respect to one another. They are arranged in a line parallel to the zodiac, and the middle one (Saturn itself) is about three times the size of the lateral ones (the edges of the rings)." He also described Saturn as having "ears." In 1612, the plane of the rings was oriented directly at the Earth and the rings appeared to vanish, and then in 1613 they reappeared again, further confusing Galileo. In 1675, Giovanni Domenico Cassini determined that Saturn's ring was actually composed of multiple smaller rings with gaps between them; the largest of these gaps was later named the Cassini Division. In 1859, James Clerk Maxwell demonstrated that the rings could not be solid or they would become unstable and break apart. He proposed that the rings must be composed of numerous small particles, all independently orbiting Saturn. Maxwell's theory was proven correct in 1895 through spectroscopic studies of the rings carried out by James Keeler of Lick Observatory. The rings can be viewed using a quite modest modern telescope or with good binoculars. They extend from 6,630 km to 120,700 km above Saturn's equator, average close to one kilometer in thickness and are composed of silica rock, iron oxide, and ice particles ranging in size from specks of dust to the size of a small automobile. There are two main theories regarding the origin of Saturn's rings. One theory, originally proposed by Édouard Roche in the nineteenth century, is that the rings were once a moon of Saturn whose orbit decayed until it came close enough to be ripped apart by tidal forces (see Roche limit). A variation of this theory is that the moon disintegrated after being struck by a large comet or asteroid. The second theory is that the rings were never part of a moon, but are instead left over from the original nebular material that Saturn formed out of. This theory is not widely accepted today, since Saturn's rings are thought to be unstable over periods of millions of years and therefore of relatively recent origin. 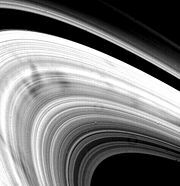 While the largest gaps in the rings, such as the Cassini division and Encke division, can be seen from Earth, the Voyager spacecrafts discovered the rings to have an intricate structure of thousands of thin gaps and ringlets. This structure is thought to arise from the gravitational pull of Saturn's many moons in several different ways. Some gaps are cleared out by the passage of tiny moonlets such as Pan, many more of which may yet be discovered, and some ringlets seem to be maintained by the gravitational effects of small shepherd satellites such as Prometheus and Pandora. Other gaps arise from resonances between the orbital period of particles in the gap and that of a more massive moon further out; Mimas maintains the Cassini division in this manner. Still more structure in the rings actually consists of spiral waves raised by the moons' periodic gravitational perturbations. Saturn shows complex patterns in its brightness. Most of the variability is due to the changing aspect of the rings, and this goes through two cycles every orbit. However, superimposed on this is variability due to the eccentricity of the planet’s orbit that causes the planet to display brighter oppositions in the northern hemisphere than it does in the southern. In 1980 Voyager I made a fly-by of Saturn that showed the F-ring to be composed of three narrow rings that appear to be braided in a complex structure, the outer two rings consisting of knobs, kinks and lumps that give the illusion of braiding, with a less bright ring inside them. Spokes in the B ring, imaged by Voyager 2 in 1981. Until 1980, the structure of the rings of Saturn was explained exclusively as the action of gravitational forces. The Voyager spacecraft found radial features in the B ring, called spokes, which could not be explained in this manner, as their persistence and rotation around the rings were not consistent with orbital mechanics. The spokes appear dark against the lit side of the rings, and light when seen against the unlit side. It is assumed that they are connected to electromagnetic interactions, as they rotate almost synchronously with the magnetosphere of Saturn. However, the precise mechanism behind the spokes is still unknown. Spokes imaged by Cassini in 2005. Twenty-five years later, Cassini observed the spokes again. They appear to be a seasonal phenomenon, disappearing in the Saturnian midwinter/midsummer and reappearing as Saturn comes closer to equinox. The spokes were not visible when Cassini arrived at Saturn in early 2004. Some scientists speculated that the spokes would not be visible again until 2007, based on models attempting to describe spoke formation. Nevertheless, the Cassini imaging team kept looking for spokes in images of the rings, and the spokes reappeared in images taken September 5, 2005. 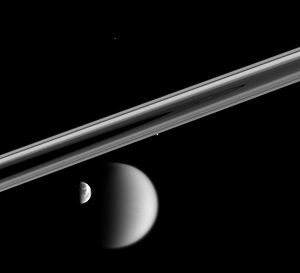 Four of Saturn's moons, Dione, Titan, Prometheus (edge of rings), Telesto (top center). Saturn has a large number of moons. The precise figure is uncertain as the orbiting chunks of ice in Saturn's rings are all technically moons, and it is difficult to draw a distinction between a large ring particle and a tiny moon. As of 2006, a total of 56 individual moons have been identified, many of them quite small. Seven of the moons are massive enough to have collapsed into spheroids under their own gravitation. These are compared to Earth's moon in the table below. Saturn's most noteworthy moon is Titan, the only moon in the solar system to have a dense atmosphere. 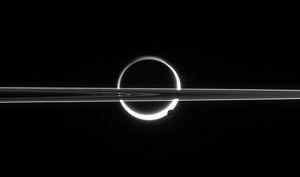 Saturn's rings cut across an eerie scene that is ruled by Titan's luminous crescent and globe-encircling haze, broken by the small moon Enceladus, whose icy jets are dimly visible at its south pole. North is up. Traditionally, most of Saturn's other moons are named after actual Titans of Greek mythology. This started because John Herschel—son of William Herschel, discoverer of Mimas and Enceladus—suggested doing so in his 1847 publication Results of Astronomical Observations made at the Cape of Good Hope, because they were the sisters and brothers of Cronos (the Greek Saturn). Saturn's major satellites, compared to Earth's Moon. A Hubble Space Telescope image, captured in October 1996 shows Saturn's rings from just past edge-on. Saturn was first visited by Pioneer 11 in September 1979. It flew within 20,000 km of the planet's cloud tops. Low-resolution images were acquired of the planet and few of its moons. Resolution was not good enough to discern surface features, however. The spacecraft also studied the rings; among the discoveries were the thin F-ring and the fact that dark gaps in the rings are bright when viewed towards the Sun, or in other words, they are not empty of material. It also measured the temperature of Titan. In November 1980, the Voyager 1 probe visited the Saturn system. It sent back the first high-resolution images of the planet, rings, and the satellites. Surface features of various moons were seen for the first time. Voyager 1 performed a close flyby of Titan, greatly increasing our knowledge of the atmosphere of the moon. However, it also proved that Titan's atmosphere is impenetrable in visible wavelengths, so no surface details were seen. The flyby also changed the spacecraft's trajectory out from the plane of the solar system. The probes discovered and confirmed several new satellites orbiting near or within the planet's rings. They also discovered the small Maxwell and Keeler gaps. Saturn eclipses the sun as seen from Cassini. On July 1, 2004, the Cassini-Huygens spacecraft performed the Saturn Orbit Insertion (SOI) maneuver and entered into orbit around Saturn. Before the SOI, Cassini had already studied the system extensively. In June 2004, it had conducted a close flyby of Phoebe, sending back high-resolution images and data. The orbiter completed two Titan flybys before releasing the Huygens probe on December 25, 2004. Huygens descended onto the surface of Titan on January 14, 2005, sending a flood of data during the atmospheric descent and after the landing. As of 2005, Cassini was conducting multiple flybys of Titan and icy satellites. On March 10, 2006, NASA reported that the Cassini probe found evidence of liquid water reservoirs that erupt in geysers on Saturn's moon Enceladus..
On September 20, 2006, a Cassini probe photograph revealed a previously undiscovered planetary ring, outside the brighter main rings of Saturn and inside the G and E rings. By now, the probe has discovered and confirmed four new satellites. Its primary mission ends in 2008, when the spacecraft will have completed 74 orbits around the planet. Saturn is known as "Sani" or "Shani" in Hindu astrology. Hindus believe in the existence of Nine Planets, known as Navagrahas. These Navagrahas were propitiated as planetary influences were thought to govern the lives of individuals. Identified as an inauspicious planet, Sani is worshipped by individuals going through a difficult phase in life. Sani's father is the Sun God "Surya." Traditional Chinese and Japanese cultures designated the planet Saturn as the earth star (土星). This designation was related to the concept of Five Elements that were thought to undergird the structure of the natural world. In Hebrew, Saturn is called 'Shabbathai'. Its Angel is Cassiel, its Intelligence (or beneficial spirit) is Agiel (layga), and its spirit (darker aspect) is Zazel (lzaz). In Ottoman Turkish and in Bahasa Malaysia (the Malay language), its name is 'Zuhal'. ↑ Saturn Mythology. Ellie Crystal. Retrieved April 22, 2008. ↑ Voyager Saturn Science Summary. Solar views. Retrieved on February 7, 2007. ↑ [http://adsabs.harvard.edu/cgi-bin/nph-bib_query?bibcode=1988Icar...76..335G&db_key=AST&data_type=HTML&format= A hexagonal feature around Saturn's North Pole. Harvard-Smithsonian Center for Astrophysics. Retrieved April 22, 2008. ↑ Ground-based observations of Saturn's north polar SPOT and hexagon. Harvard-Smithsonian Center for Astrophysics. Retrieved April 22, 2008. ↑ Hubble Space Telescope Observations of the Atmospheric Dynamics in Saturn's South Pole from 1997 to 2002. The American Astronomical Society. Retrieved April 22, 2008. ↑ NASA Sees into the Eye of a Monster Storm on Saturn. NASA (November 9, 2006). Retrieved November 10, 2006. ↑ Scientists Find That Saturn's Rotation Period is a Puzzle. NASA Cassini-Huygens Mission to Saturn. Retrieved April 22, 2008. 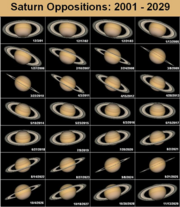 ↑ Historical Background of Saturn's Rings. NASA. Retrieved April 22, 2008. ↑ James Clerk Maxwell on the nature of Saturn's rings. JOC/EFR. Retrieved April 22, 2008. ↑ Saturn rings have own atmosphere. BBC. Retrieved April 22, 2008. ↑ The Enceladus and OH Tori at Saturn. Harvard-Smithsonian Center. Retrieved April 22, 2008. ↑ Variability in Saturn. British Astronomical Association. Retrieved April 22, 2008. ↑ NASA's Cassini Discovers Potential Liquid Water on Enceladus. NASA. Retrieved April 22, 2008. ↑ New Ring Spotted Around Saturn. Independent Online. Retrieved April 22, 2008. ↑ Mentioned in the Kabbalah. Moore, Patrick, (ed. ), and Mark Kidger. "The 1990 Great White Spot of Saturn," The 1993 Yearbook of Astronomy. 176-215. New York: W.W. Norton & Company, 1992. Planets - Saturn – A kid's guide to Saturn. This page was last modified on 20 August 2015, at 19:23.